Our trendy and stylish kurtis have different necklines varying from round, square, v-shaped and other intricate patterns. They are comfortable for wear to college, office or any other formal or festive occasion thus, breaking the confinement to which they were previously centered. Matching jeans, churidars, leggings and trousers does the best job of eliciting a look of beauty on the wearer. We are manufacturers and wholesalers dealing in ladies wear. We have wonderful collection of indian bollywood fashion tunics, kurtis, and embroidered kurtis. Indian kurtis are all the way comfortable yet elegant. Kurtis-tunics are easy to wear and care as well. Indian ethnic kurtis are the latest trend in indian fashion, some are embellished with gorgeous and embroidery work. Our designs are created keeping in mind the latest trends, fabric and colours of the season. 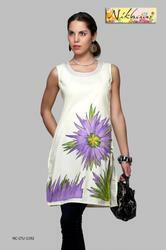 Kurti Tunic We are a distinguished manufacturer, wholesaler and trader of a wide assortment of Ladies Garments. our products are a perfect blend of contemporary fashion and traditional designs. Designer Kurti Tunic We are a distinguished manufacturer, wholesaler and trader of a wide assortment of Ladies Garments. our products are a perfect blend of contemporary fashion and traditional designs.